At 5.895 metres above the sea level, Mount Kilimanjaro is the tallest mountain in Africa. It is made up from three ancient volcanic cones - Shira, Mawenzi and Kibo. The highest peak of the mountan, Uhuru Peak, is on the rim of Kibo's crater. 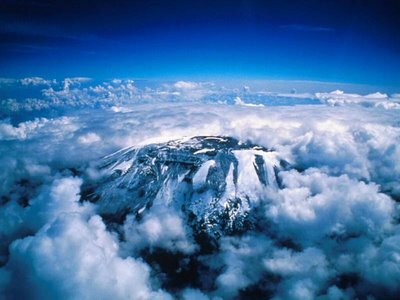 Of the three volcanoes, Mawenzi and Shira are considered dead, and Kibo is dorment. However, Kibo is emitting gas from it's crater, and scientist have concluded the molten magma is present only 400 meters below the crater. Mount Kilimanjaro is a popular site for trekking. There are six relative safe trekking routs, with various difficulty. It is possible to reach the summit for a reasonably fit person, but research is adviced before attempting. The first people credited to climb the mountain are Hans Meyer and Ludwig Purtscheller. The Serengeti National Park is an almost 15.000 square kilometres large national park in the Serengeti area in Tanzania. The park was established in 1951, but it was partially protected since 1921, when lions were threatened. There is a huge variety of different animals in the park, and it's considered one of Africa's best wildlife reserves. 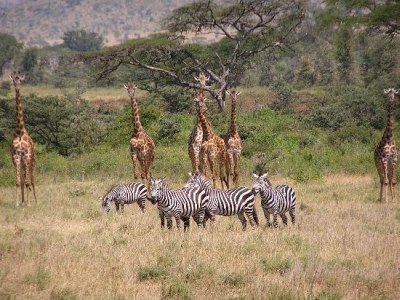 It is most known for the half a million wildbeasts and 250.000 zebras living there. One can alos find a huge stock of buffalos, lions, rhinos, elephants, ungulates, hyenas and many other creatures. Due to it's amazing wildlife and ecological significance, the park has been added to the list of UNESCO World Heritage Sites.